Do you ever ask yourself that question? This query need not be existential in theory; I refer rather to one’s geographical location. 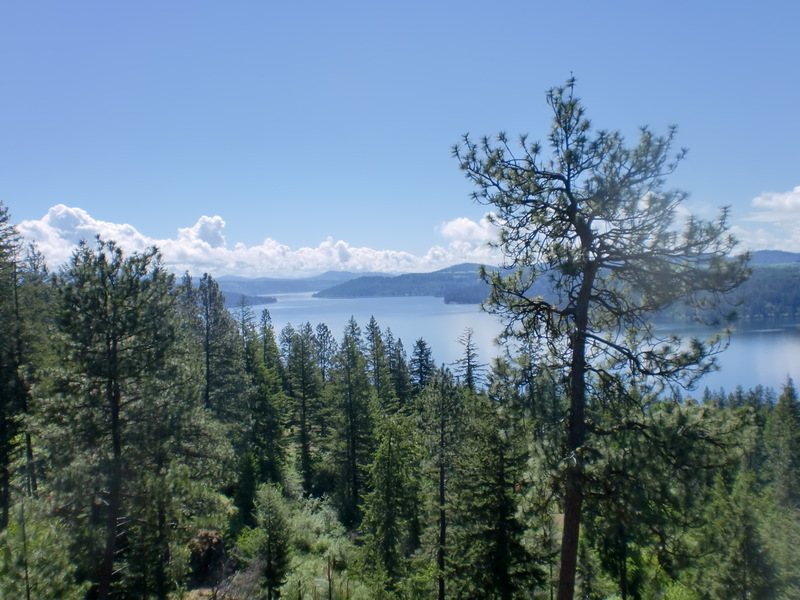 Windy Bay, Lake Coeur d’Alene is our present home. When I reached the age of seven, I was sent Canoe Lake, in Algonquin Park, Ontario to attend summer camp for the month of July. I had been waiting desperately for the big event. My older siblings had all gone off ahead of me, and I could not wait for my turn. While my mother fretted about me being so young my father had utmost confidence in me. As a camper in training, I swam my three hundred yard requirement with him in the cold waters of Lake Joseph where we kept our summer home. On my first day at camp, I dove in confidently, assuring everyone in sundry that I could do it. In fact, I had already done it that morning at the crack of dawn. I took to camp like a duck to water and loved every minute. The first night, the camp director’s husband, Dr. Harry Ebbs, came to talk to us, and give us a bedtime story. He wanted to tell us about trees. He took us out- a little gaggle of girls in baby doll pajamas with flannel robes wrapped around us and flip flops on our feet, for a brief walk in the woods. He had something to show us. We looked at a beautiful assortment of saplings of birch and fir, protected by buildings on three sides. Next, we walked the length of the island to see an amazing pine jutting straight out over the water with roots clutching to the bare rock. Which trees had the greatest chance of survival, he asked? We thought the protected ones would fare the best, and all chimed in that the trees behind the lodge would have the best chance. He surprised us all by telling us that we were wrong. The dramatic pine, bent by storms and seeming to be facing the greatest of challenges would fare the best. Why? He told us that the saplings were vulnerable because of their protection. They did not have to develop deep roots. A squall could topple them, but the tree that fought for every square inch of its territory had developed the roots to endure. He then added that our parents had sent us to camp in order to develop our roots. A few nights later we trooped into the lodge, a great building designed for dramatic events, to see a film about the voyageurs, the hearty fur traders who explored the lakes and rivers of Canada. My hair stood on end. They sang as they paddled, and this old film re-enacting their journeys featured a map showing us how far they traveled. The next day we went out to learn how to weave, and I endeavored to make a voyageur belt, a long affair that wrapped around the waist twice and ended in a fringe. Perhaps it was the sight of me in that belt that I would not take off, or perhaps it was my love of camp, or perhaps it was something in my nature that led my dad to call me la fille du bois. We did not speak French in our home, so he explained that it meant girl of the woods. Years later, when living in Sacramento, California and contemplating our future, we planned a trip north to visit relatives in British Colombia. 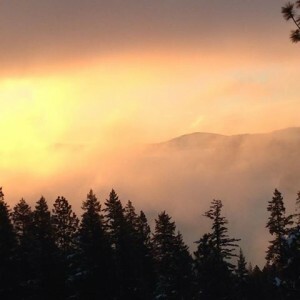 I had often begged to drive through Idaho as I had been curious after reading Ernest Hemingway. A more direct route was always favored until a fortuitous offer of free accommodation near Rathdrum changed the route. Looking at a map in my father-in-law’s fantastic atlas, I saw the French names of the lakes in North Idaho. That prickly, funny feeling crept across my scalp and into my heart. I knew there could only be one reason: the voyageurs. So we drove up with our kids in the backseat of the old Subaru station wagon full of excitement. We were heading north from Moscow when I saw a sign depicting a boat launch. “Turn!” I yelled. “Turn! This must be Lake Coeur d’Alene!” We drove down to Sun Up Bay. “It’s great!” I screamed. When we got back in the car, we carried along the upper part of the road until we came to a stop sign. We could not proceed, due to its designation as private. We stopped to admire the view which by the strangest of all co-incidences, is where we live right now. More years later, I took an interesting journey with ancestry.com following the line of my paternal grandfather, James Gaudette, a man I never had the privilege of knowing. I was astounded to learn that records kept leading me back in time all the way to 1635 when the family arrived in Port Royal, the first settlement in Acadia, now Nova Scotia. This summer I read Peter Stark’s, Astoria. Once again, I thrilled over tales of the voyageurs. Peter Stark maintains that many of them had been trapping all through the eighteenth century, originating from Port Royal. Sources of the River, Tracking David Thompson Across North America, by Jack Nisbet, is another excellent tale of unbelievable tenacity in the face of boundless wilderness. It was on that first trip to North Idaho that I read a roadside marker depicting Thompson’s journey. Perplexed, I thought, this can’t be the same David Thompson. I knew him from the old camp movie, for it was he who first mapped Canoe Lake and Lake Joseph in Ontario. Yet it was. 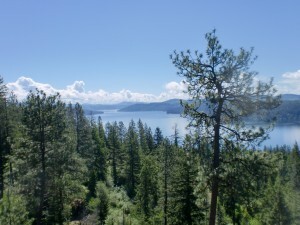 I often tell people that it is possible to travel from Montreal to Lake Coeur d’ Alene by canoe and portage. I get a very blank and confused expression in return. David Hackett Fischer’s, Champlain’s Dream, is a detailed and masterfully written book depicting the founding of French Canada. He, too, was a great explorer. 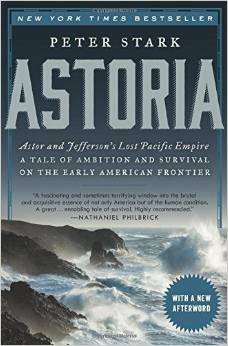 In reading Astoria, I learned of John Jacob Astor’s failed attempt at founding a colony in the Pacific Northwest. The idea was to establish a sea route from New York, to Hawaii, to Astoria, in what is now Oregon, to China and from there to London, and again to New York. The overland route from New York to Astoria would be established through the United States. 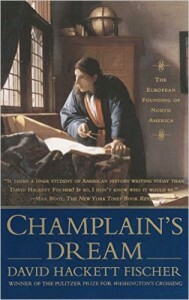 The grand scheme became an epic and legendary disaster. Why do some colonies flourish while others fail? What was the difference between Port Royal, and Jamestown or Astoria? It is a fascinating question well worth exploring. In Astoria, terrible decisions were made on the overland route. The leaders kept going back to Astor’s dictates while the men of the Northwest Trading Company, the voyageurs used their instincts and ability to rely on the wisdom of the ages. Gleaned from the natives who had been here since time immemorial, they learned established canoe routes, and questioned dictates to boldly go where no man had gone before. How did I get here? Perhaps I followed my heart. I could have followed it right to Lake Coeur d’ Alene. Was it my destiny? That I cannot answer. I do know this, however. I have never been sorry. Not for one single minute. Our children grew to love and cherish this land. Every time I call the Coeur d’ Alene Casino, I am greeted with these words: Welcome Home. This entry was posted in fiction, Uncategorized and tagged Astoria, Canada, Champlain, Idaho on August 12, 2015 by Elizabeth Smythe Brinton.